That voice, those shades, the day-glow colours… it all added up to someone who transcended wrestling in a way that perhaps has only ever been done by Hulk Hogan. Savage was a genuine rarity, in that the mainstream was aware and approving of him. Since his untimely death, tributes and reports of his death have appeared in places you wouldn’t expect “just” a wrestler; even on ESPN – they carried news of his passing, and popular panel show Around The Horn’s presenter Tony Reali dedicated Friday’s show to the Macho Man, declaring “This is for you, Macho”. 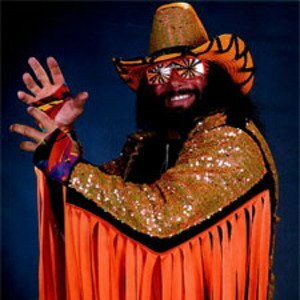 Perhaps the sports channels interest can be explained by the days before The Macho Man ate his first Slim Jim; in the days before Randy Savage was born, Randy Poffo had a promising four year stint in the St Louis Cardinals minor league baseball system – but a little known minor league player wasn’t who they referred to. It was the legend – and there’s a word thrown around a little too much, but in this case, wholly deserved – that was The Macho Man, Randy Savage. When you look back – several things jump into your mind. All those fringes and tassles, the cowboy hats, and the promos… oh, the promos. In one promo, Savage could veer from quiet anger to all out insanity, and back again – and make it all seem plausible. Throw in the classic “OOOOOOH YEEEEEA-UH!!! !” that is one of the most imitated catchphrases in wrestling’s history, and Savage just set the screen alight. That’s not saying that he couldn’t go hell for leather in the ring, though. He was a beast between the ropes… his matches with Ultimate Warrior, Ric Flair, Hulk Hogan and of course, Ricky Steamboat blazed a WrestleMania trail that few can dream of topping. He owned one of the quintessential WrestleMania moments when he reunited with Miss Elizabeth in the aftermath of his match against The Ultimate Warrior… not a dry eye in the house, this one included. Savage was truly one of a kind, yet paved the way for countless others to follow. Even now, when I see a flying elbow from the top rope, my mind flicks back to seeing Macho’s picture perfect delivery of the same move. Look at Jay Lethal – he made a name for himself in TNA by impersonating The Macho Man perfectly. Sadly, nothing lasts forever… yet The Macho Man was one of those guys you always figured would ALWAYS be there. Losing him while he’s still so young, and in such a shocking manner just feels… wrong. It’s more of a numb feeling than I can ever remember feeling when someone “in the business” passed away. I’ve spent a lot of time over the past couple of days on YouTube, just soaking in all of the Macho Madness, as the man himself would have put it… every time Mean Gene Okerlund looked a little bemused by what was happening in front of him, every time Macho himself talked himself into a corner he couldn’t get out of, and literally mentally rebooted himself live on camera… all of them made me smile. In the end, that is Macho Man’s legacy. He made people smile. He entertained us all. He will not be forgotten by anyone that ever saw him. That’s not a bad way to leave your mark.